Want a casino you can rely on? One that you know will always pay you your winnings? One that offers easy deposit and payout options, with outstanding customer support - 24/7? Most importantly, a casino that allows you to play in the USA? Then look no further! Bovada gives you everything you've been searching for. Reliable - Bovada has never missed a payout. Easy banking - Bovada offers Bitcoin as an option. Customer Support - English-speaking, knowledgable, efficient and friendly staff - phones answered on 1st ring and most problems solved quickly. Bovada players are the most loyal of any casino, with many of them playing exclusively at Bovada and nowhere else. Once you're at Bovada, you'll see why: it's a one-stop destination for all your gambling and online entertainment needs! In line with most modern casinos, Bovada is available as instant play only (i.e. no download option) but it's clearly designed with a multi-device audience in mind, and it works equally well on all devices. 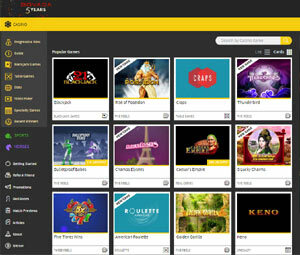 Selecting games is easy - you can display all available games as either a list or in a grid format, which you can organize and select by clicking on the relevant tabs (e.g. Slots, Table, Video Poker etc). The list of available games is automatically updated to show which are available on your current device. Like our #1 US-facing casino (Dreams) Bovada uses the tried and tested RTG software. Although solid and reliable, Bovada recognises that the RTG games can sometimes look a little dated in today's market and have moved to address that by including brand new games from Betsoft and Rival. Free play games are a core principle of Fortune Palace ('Learn, Practice, Play') so a major plus point is that Bovada allow you to play ALL their games in Demo mode, so you can play without having to make a deposit! Bovada know it's important for players to become familiar with a game in order to fully enjoy the casino experience. Every game in the menu has a 'Learn More' option, which is designed to teach beginners all the ins and outs of each game. Bovada is a fantastic casino for Slots players, with over 200 games in total. The games interface is searchable, so you can see just the 3 reel or 5 reel slots, or get a list of Progressives. Bovada led the way with the introduction of both 3D and iSlots and now offer a great selection of both - 22 iSlots and 10 3D Slots. They're also big on Progressive Jackpots with over 26 up for grabs. The current totals and recent winners are updated daily (check out the 'Progressive Wins' option). Bovada are constantly adding new games to the Slots category, ensuring they stay up-to-date with the latest releases from their suppliers. Bovada offers a decent, if limited, selection of Table games. You can find all the major games (Baccarat, Blackjack, Roulette etc) but you won't have the extensive varieties that you would find at some of the Microgaming casinos, for example. But if your preference is to play simple a simple, straightforward game of Roulette or Baccarat, the games are more than adequate, with simple, easy-to-use controls and solid graphics. The RTG software is quick, clean and has been proven to be reliable and trustworthy over many years. Where Bovada scores highly is in its selection of Blackjack games. In addition to Single Deck and Perfect Pairs (see our Blackjack variants page for details) Bovada also offer the intriguing Zappit Blackjack, where - if you're dealt a hard total of 15, 16 or 17 - you can 'zap' your cards and exchange them for new ones! Great fun and another inventive twist for those feeling a little bored with blackjack. If all companies operated like Bovada, the world would be a much more pleasant place indeed! I successfully made a deposit and received my bonus without jumping through hoops! Join these happy players now! 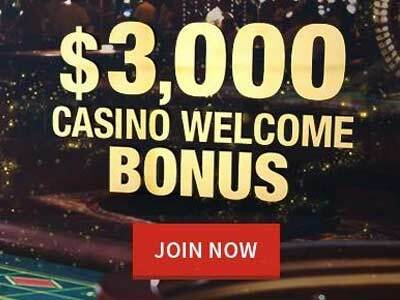 Bovada offer new players a &dollar;3000 Casino welcome bonus package - your first THREE deposits will be 100% matched up to a maximum of &dollar;1,000 each. Wagering is a decent 25x and most games (except Craps) are eligible for play. For full details of the welcome bonus offer, read here. For exisiting customers, Bovada offer a VIP rewards scheme known as the Red Room, where the more you play the more rewards you get. Red Room members can expect weekly deposit bonuses, exclusive Red Room offers, convenient deposit options and free expedited payouts. Bovada also have some inventive weekly bonus offers like Table Mania Tuesday, Blackjack Weekends, a Mobile Casino bonus and a Refer-a-friend deal where you get a cash bonus worth 200% of your friends' deposits! ALthough the banking options at Bovada are limited when compared to some of our other casinos, they are again leading the way by being one of the first online casinos to allow deposits and withdrawals in Bitcoin. Those familiar with Bitcoin will need no explanation, but it's a distributed peer-to-peer digital currency that is stored in a 'wallet' (like a digital bank). Like Neteller, Paypal or Skrill, it's electronic cash that you can use to send money to friends or merchants. It’s safe, reliable, fast and ideal for use at Bovada. 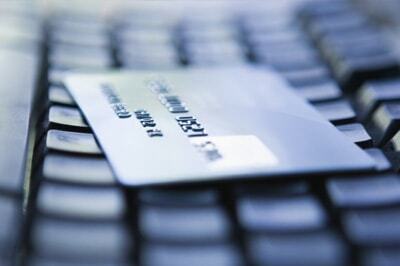 Other options include Visa and Mastercard credit cards and Visa Gift cards. Minimum deposits are very low (just &dollar;20) and you can deposit up to &dollar;1,000 via credit card and &dollar;5,000 with bitcoin. Although your first deposit is free of charge, a major negative at Bovada is that subsequent deposits will be subject to a fee - 4.9% for Visa and 6.9% for MasterCard. Similarly, you can make one free withdrawal per calendar month, but subsequent withdrawals in the same month will incur a &dollar;50 processing fee. This isn't great, and may be designed to encourage you to use Bitcoin instead - where banking is free of charge. Bovada is iTech Labs certified, and they are accredited by the ICRA (Internet Content Rating Association). The casino is audited monthly, and the Random Number Generator is certified to produce fair gaming for players. Bovada have invested in the latest technologies and implemented the strictest and rigorous procedures to ensure that your sensitive information is safe during online transactions. All confidential information is safeguarded by Secure Socket Layer (SSL), as represented by the padlock visible on your browser’s address tab. Each SSL Certificate is a unique credential, identifying the certificate owner. This ensures the security of any and all private information provided by the website. Bovada encrypt all private player information which is only accessible to relevant staff members on a need-to-know basis. Responsibility is a strong part of Bovada's culture. Most casinos provide links to organisations such as GamCare and Gamblers Anonymous, but Bovada take this part of their role very seriously, and have a separate section dedicated to responsible gambling - not just problem gambling, but prevention of underage gambling, too. You'll find great advice on how to set Self-exclusion periods if you feel you're getting in too deep. It's all aimed to help you see gambling as a form of entertainment that shouldn't negatively impact on your life. Bovada's telephone support is very good - phones are manned 24/7 by English-speaking, knowledgable, efficient and friendly staff, operators are encouraged to answer on the ring, and most problems solved quickly. But it has to be said that telephone support is pretty well the bare minimum expected from Customer Support by the modern player. No Live Chat option is a major negative and we'd hope to see Bovada improve in this area in order to improve its overall rating. Bovada took over the mantle of Bodog casino, which for many years was far and away the best casino for US players. Bovada has made a big effort in updating Bodog's offering, to bring it in line with what modern players expect. In that respect, they've done an excellent job - the games are a good mix of old and new and the interface works really well, regardless of which device you choose to play on. Using multiple software suppliers means an excellent range of modern Slots and a decent selection of easy-to-play Table Games. There's an excellent sign-up bonus package, and a good range of weekly bonuses, plus an excellent rewards scheme for long-term loyal players. Things have changed a lot since Bodog's heyday, of course, especially in terms of the legal status of gambling in the US, and Bovada deserve a lot of credit for staying in the game and allowing US players to get online. The Bitcoin option is very welcome, and maybe Bovada realised that they had to move in that direction in order to continue to allow US players access. But we can't help feeling that the customer support offering is lacking, and charging for depositing is a bit of a low blow. All in all, Bovada remains a great choice for US players, and if you're happy to use Bitcoin and don't need to be guided through the playing process via Customer Support, it may well suit you perfectly!